Waterfed Pole (Reach and Wash) . This system is now considered the Industry standard for cleaning windows as it greatly reduces the risks associated with ladders. Cleaning with Cradles. We have over 20 years experience of using cradles on large buildings, all of our staff are fully trained in Cradle usage. Fascia And Cladding Cleaning. 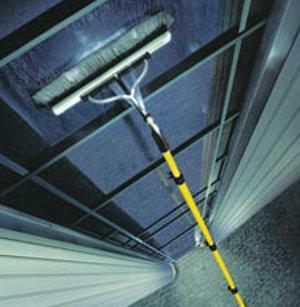 We specialise in cleaning and restoring building facades and cladding on industrial and commercial buildings. 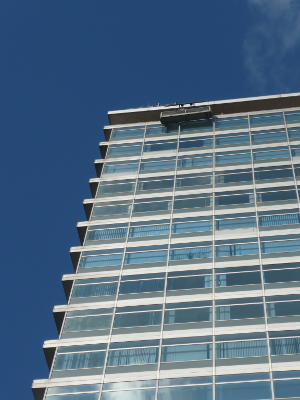 This type of cleaning helps to increase the lifespan of the cladding and reduce costs for property managers and owners, as well as enhancing the appearance of the building. Gutter Cleaning. April Cleaning Company provide a fast, efficient gutter clearance service for commercial buildings and residential buildings throughout Greater London and the Home counties.